Wow. Today in my morning CrossFit class we tried out our new Prowler weighted sled. 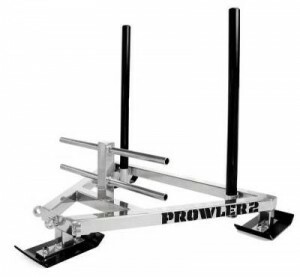 The Prowler is one of the best ways to develop strength in your legs, hips and arms. You can add weight plates for increased resistance. After today’s workout, I definitely feel it in my glutes, quads, and hamstrings. Nothing quite like it! Want to build up a bigger, rounder, firmer booty? Then you should try the Prowler workout. Seriously. Check out the video at the bottom of this post. The high post push isn’t that bad (depending on how much weight you add to the sled and how fast you push). But, the low post push is a killer. You can see how much it takes out of you in the video below. 5 people in our class threw up today. It’s called the “prowler flu” and apparently it happens a lot! Luckily, I didn’t get a case of this “flu”, but my legs were definitely shaking by the end. It’s hard!